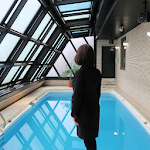 Ms. Es Kei is Stuck in a Room with a Pool! message "Error with code when fetch APK file: 403"
I have updated it with a second download source. Hopefully that works better for you! Well... I'm trying to play in Nox. Game loads, there's a load of intro text and then... nothing but the opening shot of a woman standing by a pool and the dialog "By making use of various items, Let you escape from this room!" Can't navigate anywhere or do anything else. Have no problem with other games running in Nox. In other words, Ms. Es Kei is not the only person stuck in a room with a pool!